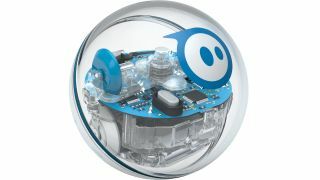 Sphero, the maker of the popular BB-8 toy and the Sphero robotic ball, has released a new user-programmable robotic sphere which it wants to use to teach kids to program. Like the original Sphero, the SPRK+ is a small sphere, but unlike its precursor its shell is made of a transparent plastic that makes it look a little like a Raspberry Pi mounted inside of a hamster ball, giving it more of a maker vibe. Using an accompanying Lightning Lab app (available for iOS and Android), users can code programs to control the robot, which can run on both land and water, and then share these programs online. The SPRK+ is part of a growing number of games and toys aimed at making programming more accessible. Recently Apple announced the Swift Playgrounds app for iPad which is aimed at making the process of learning its Swift programming language more approachable. Additionally, although the Raspberry Pi has seen the majority of its popularity come through its use by makers, it was originally designed to provide a cheap and easy way for kids to learn to code.